Inspired by the award-winning documentary Planet B-Boy, from director Benson Lee, Battle of the Year showcases the exhilarating and awe-inspiring world of competitive dance, in a way that illustrates how it is both a display of athleticism and an art form to rival any other. When hip-hop mogul Dante Graham (Laz Alonso) turns to his old friend Jason Blake (Josh Holloway) to create and coach an American all-star dream team of b-boys to win the legendary Battle of the Year, hip hop’s premier competition held in France, he struggles to transform 13 individuals into a disciplined and cohesive crew. At the film’s press day, actor Josh Peck (who plays assistant coach Franklyn) spoke to Collider for this exclusive interview about what it takes for these dancers to pull off what is required of them, how even though he didn’t dance on camera, he did try to learn some of the moves, where he falls in the debate about whether dance is a sport or an art form, what he thought about the performances during the battle sequences, working with co-star Josh Holloway, adding a little much-needed female energy to the mix, and how he’s looked for a variety of acting roles, since his days on Nickelodeon’s Drake & Josh. Check out what he had to say after the jump. Collider: When you signed on to do this film, did you have any idea what the b-boy world really was? JOSH PECK: I definitely was unaware of what these dancers are required to do in this world. Seeing, in the ‘80s, the inception of b-boying to what it’s become now, the growth that it’s had and how it’s taken this foray into acrobatics and tricking, these guys are real athletes. I grew up a hip-hop head and always loved hip-hop culture, and b-boying is such a big part of it. So, I was aware of it, and yet it wasn’t until I was truly in the world that I grew a real appreciation for what b-boying is and for what these guys are able to pull off. Even though you don’t dance on camera, were you ever tempted to learn the dance moves or try any of the choreography? PECK: Oh, absolutely! And it was always very sobering when I would realize how hard it truly was. There’s a technicality side of b-boying, and then there’s just the attitude. I’ve got attitude for days. That part, I had down. The technicality portion is where I was a bit dysfunctional. So, your character’s comment of being a dancer in his heart applies to you, as well? PECK: It’s sad, but true. I believe I’m a better dancer than I am. I’ve been complimented by people before, but I’m not sure they know what good dancing is. Did you ever have any discussions about why your character is Franklyn with a “y,” and why he makes such a point to let everyone know that? Do you know if there’s any significance to that? PECK: I didn’t really dig into it. The fact that he was Franklyn with a “y” and was so emphatic about making a point that it’s a “y” was just one of those great character gifts. Everyone in life has their eccentricities and peccadillos that make them who they are, and I think Franklyn’s is definitely his insistence that you realize it’s a “y,” and nothing less. Obviously, there’s the debate between whether this is a sport or an art form. Do you have an opinion on whether it’s one or the other, or do you see it as both? PECK: I don’t know if I have an opinion. I’ve heard from b-boys and I think more of them lean to the artistry side of it, but it doesn’t discredit the physicality in what’s required of them. Not to get too actor-y, but when your body is your instrument, it needs maintenance and it needs to be held in a certain way. That’s a universal thread, whether you’re an athlete, a dancer, an actor or a singer. It’s all about maintaining your body because that allows you to do what you do. What did you think, as you watched these b-boys perform, especially during the big battle sequences? 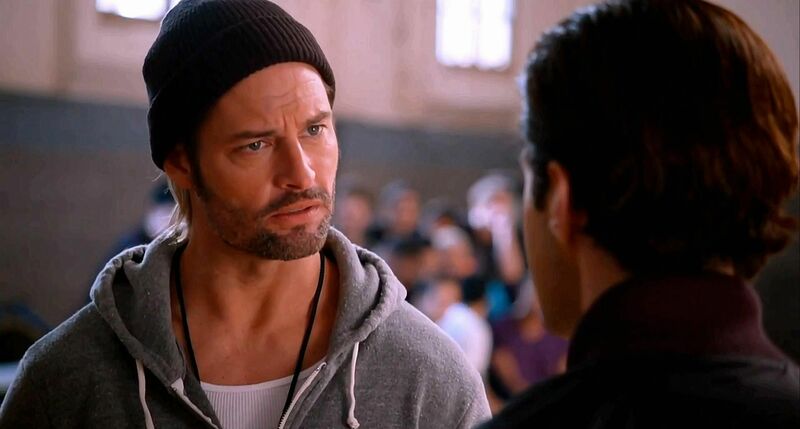 There are some really emotional and really funny moments between your character and Josh Holloway’s character. How was it like to work with him, and how was it to also add Laz Alonso to the mix? PECK: I don’t like to share my name with anyone, so when there’s another Josh on set, he better be cool, or we’ve got problems. You know, Josh comes from the TV world and, when you’ve worked that much, you become such a pro at knowing exactly what your role is and how to help other actors and be there for them, 100%. We just fell into this great groove with each other because he was so open to trying things, and he loved to laugh when I would break out a joke. I knew he was always there for me. And Laz is similar, in that respect. He loves to laugh. It was really a boys’ club, on set. We knew that the star of this movie is the dance. Laz and Josh and I were really there to uphold the story, so we felt that responsibility. We just wanted to do a great job of that, so it was nice. There were no divas on set. Was it fun to add that female energy, with Caity Lotz? Was part of the appeal of this film the fact that it is so different from anything you’ve done before? PECK: This is definitely a departure from stuff I’ve done, like The Wackness with Sir Ben [Kingsley]. And I just wrapped this movie Imagine, with Al Pacino. I’ve been incredibly lucky. It’s like that phrase, “Adapt or die.” When you think you can only do one specific thing is when you really cut yourself off from great possibilities. So, I had such a great time being with these guys. It was such a boys’ club, and we were cracking up on set. And I was challenged in a way that I never have been before. I just hope to continue to get varied opportunities and hopefully people enjoy it. Was that something you were really aware of, when you were looking for roles during that transition period from child actor to adult actor? PECK: Initially, coming off of Drake & Josh, which was something I did from when I was 13 years old until I was 19, I definitely wanted to find something that would allow me to break out of a certain typecast or a way that people saw me. Also, with maturation, I’ve started to really embrace how important that character was to people, and how it still lives on, on TV today. You can bring truth to anything, whether it’s a dance movie or an incredibly poignant indie drama or a really broad comedy. As long as you show up to play, I don’t think you can go wrong. But now, I’m just open to all opportunities. So initially, absolutely, I definitely wanted to prove that I could do other things. Now, I’m just open to whatever seems to be the right thing. Battle of the Year opens in theaters on September 20th.